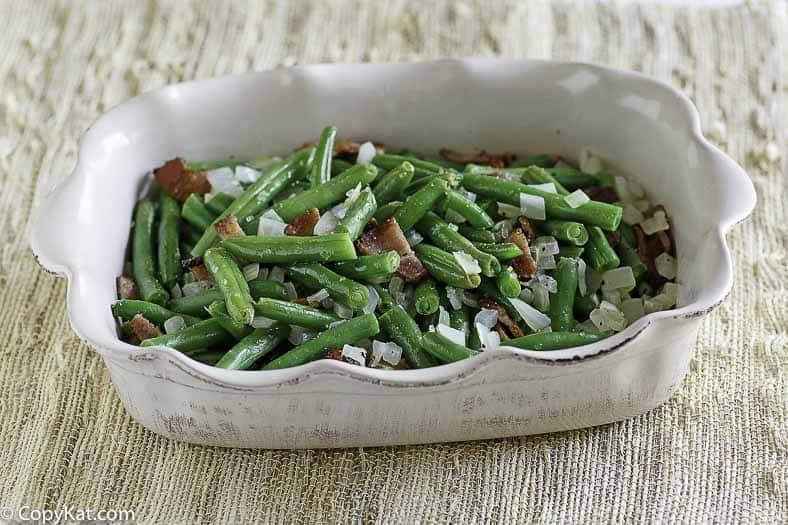 Cracker Barrel Green Beans are an irresistible side dish you can recreate at home. The green beans are a side dish not to be missed. These beans have a wonderful smokey flavor with the bacon. 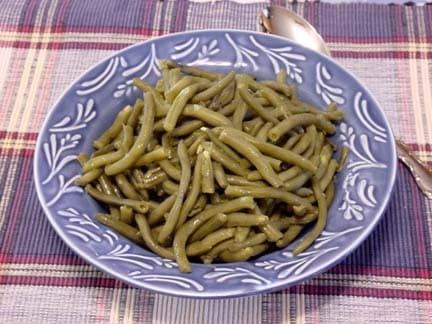 Every time I go and order these green beans I am instantly transformed into my Grandmother’s kitchen at a Sunday dinner. One reason so many of use go to the Cracker Barrel is their Hash Brown casserole, but they are also known for the huge variety of side dishes. They serve over 10 different side dishes for you to enjoy. Unlike some restaurants, all of their food is made fresh in their kitchen. This is one of the places so many of us go when we want to recreate the experience of a sit-down family dinner, or a dinner that our Grandparents would serve. 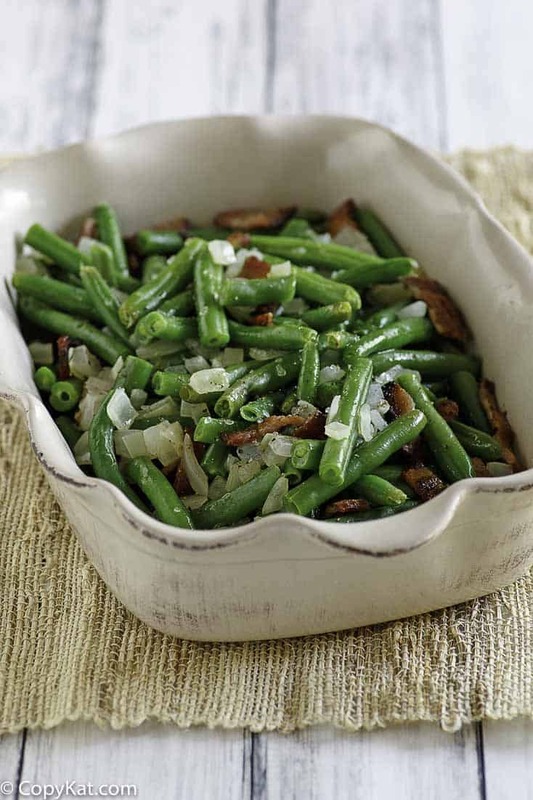 Who doesn’t love the classic side dish of green beans? Cracker Barrel is known for their flavorful green beans that are seasoned with bacon and onions. This is an easy and flavorful side dish you can make at home. It requires so few ingredients that it is an inexpensive dish for you to make. You will need green beans, bacon, onion, and a touch of sugar. Four ingredients all you need to recreate this side dish that the Cracker Barrel is known for. 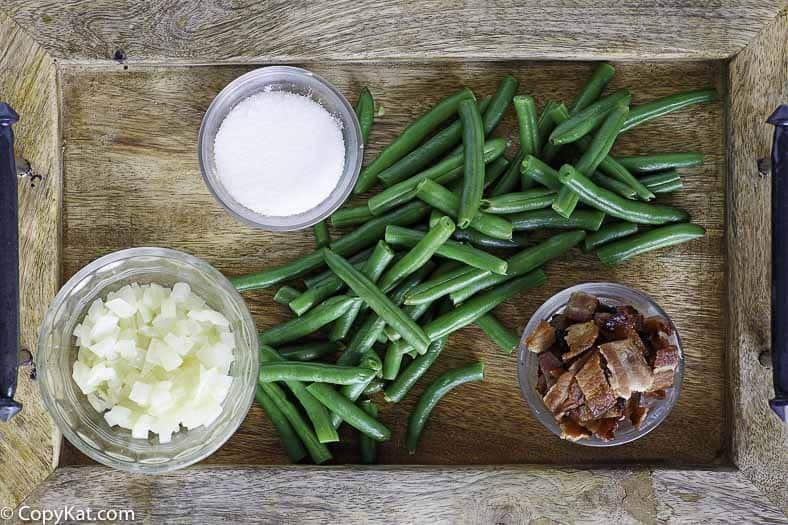 You can enjoy Copycat Cracker Barrel Green Beans any night of the week with this copycat recipe. In a two quart sauce pan on medium heat, cook bacon until lightly brown but not crisp. When bacon has browned, add green beans. Add salt, sugar, and pepper and mix well. Place onion on top of green beans; cover with a lid and bring to a light boil. Turn heat down to low and simmer beans for 45 minutes. Cooking the green beans for 45 minutes on a very low simmer will blend the flavors. I must say, we love a variety of vegetables at every meal, but green beans can be on my plate several times a week. That looks nothing like the green beans at Cracker Barrel, but it tastes just like them. Am I missing the actual recipe? Not sure why 90% of these copy cat recipes call for adding sugar. Cracker Barrel NEVER adds sugar. As a 5 year past manager of Cracker Barrel the recipe calls for 3 large cans of green beans- drained; 1 chub (about 5 lbs) green bean seasoning- a mixture of bacon lard, sausage lard and pieces(this is melted down and provides the liquid); bacon pieces (about 2 lbs); salt and pepper to taste. The green beans are then slowly cooked for 2 hours. For me it is important to duplicate the recipe as best as I can the way it is served in the restaurant. Hi Mike. I know you posted your comment last year but I’m just now seeing it. I love some of the dishes made at Cracker Barrel and want to make them at home. How are the fried chicken tenderloins made? This is what I order any time I go to CB. I get the tenderloins, green beans, pinto beans and mashed potatoes. My beans always taste like the can! What brand of beans do you use? God bless you for that! I look forward to making this on Thanksgiving. I just love Cracker Barrel’s green beans. I’m looking forward to some tasty side dishes this year. Any other suggestions for a good vegetable dish that can be made, or at least prepared, ahead of time would be appreciated. Have you ever done this in the crockpot? I work 8-5 and don’t have the time to make the beans right before dinner. 🙁 I was thinking cooking the bacon on the stove and then adding it all to the crockpot. Sounds great.. do you leave the bacon in the green beans or remove it after cooking? I love these from Crackle Barrel…how many slices of bacon is 1/4 pound? Is your bacon thick cut or thin cut? Is the bacon thick or thin sliced? It depends on the thickness of the bacon. If your package of bacon is 12 ounces, it is about 1/3 of the package of bacon. You can use them, you will need to cook them a little longer. i added the onions while frying the bacon and added more salt and pepper than what it calls for. Other than that, it was great, just like my grandma used to make! I used the bacon grease in the beans. Do you use the bacon grease or discard it after the bacon is cooked? Do you chop the onion up or just put the whole chunk of onion in the beans? This onion piece should be chopped. I made two huge pans of this fantastic recipe for a big Christmas dinner at my sister-in-law’s house today. My kitchen smelled JUST LIKE Cracker Barrel while the beans were cooking and they tasted identical. So easy and so good, I will never make green beans any other way again!